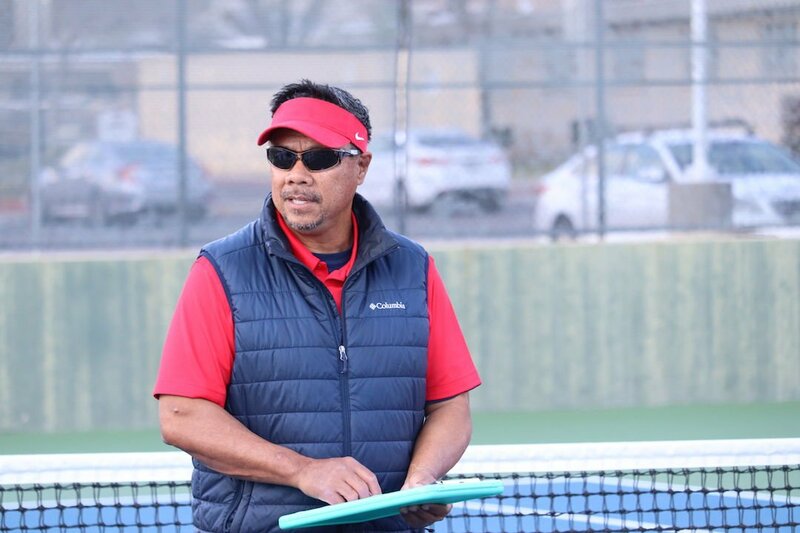 Noel Dalton, a Bakersfield College tennis alumnus in his first year as head coach, wants to bring Renegades tennis back to its "Golden Age." Bakersfield College sophomore Conrad Dalton is the son of head coach Noel Dalton. It’s easy for Noel Dalton to pick out, in his opinion, the best player in Bakersfield College tennis history. Hank Pfister, who went on to play in the Grand Slam tournaments and was once ranked No. 19 in the world, is the only option. Pfister, who used two years at BC to earn a scholarship to San Jose State in the 1970s, was part of what Dalton calls the “Golden Age” of tennis Bakersfield. It’s what Dalton, the first-year Renegades, coach is trying to restore. BC’s men’s team went 3-15 during the regular season, which just ended. The women, led by assistant coach Austin Lee, went 17-4. Sophomores Kayleen Sanchez and Paige Darstein, on the women’s team, will play each other in the Western State Conference singles final on Friday. The two first team All-Conference selections will also play together in the WSC doubles semifinal. Dalton won a Central Section title while at West High. He played at BC in 1983 and 1984 so he looks back fondly on the history of the Renegades tennis program and tennis in Bakersfield. The Bakersfield Racquet Club hosted the Davis Cup, the premier international men’s tennis team event, in 1965. There was a time, Dalton said, when BC consistently sent tennis players to Division I and other four-year schools. Dalton’s son Conrad is one of two sophomores on the team. Conrad played No. 3 singles. Dalton’s friend Phil Friden, who played club lacrosse at Pepperdine with him, joined the team. Friden played No. 2 singles and is an amateur tennis player who plays about 15 hours a week. Friden, who is 53, serves as basically a player-coach, Conrad said, and someone the younger players can look up to. BC Athletics declined to make Friden available for an interview. Pointing out the courts that were recently resurfaced, Dalton said BC athletic director Sandi Taylor has been a strong supporter of the program. It will be important, Dalton said, to get local players to come to BC to play tennis. The men’s and women’s teams only list eight players for each roster. Many high school students don’t know “how great” the education is at Bakersfield College, he said, and that there are opportunities to transfer to four-year schools. Good luck, coach. I hope you are successful!